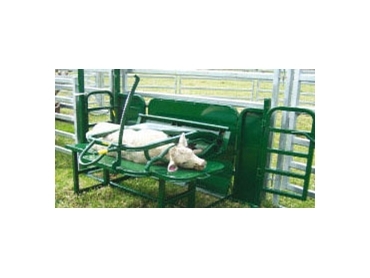 Everyday livestock handling is a safer and simpler task with Commander Ag-Quip Innovative Farm Equipment new cattle crush series with improved OH&S features. The Ag-Quip Q-Catch 200 Series cattle crushes have been designed as a result of requests from farmers looking for a safer and easier cattle crush. Commander has added new features to the product to increase farmers’ OH&S compliance. The new cattle crush includes air operated controls, including the split rear slider and an option for the parallel side squeeze, that provide increased operator safety and efficiency. The air operated head bail has a unique dual locking system which means the doors lock on the door, rather than a linkage. The heavy duty equipment has precision made components and opens easily under extreme pressure. Designed to strict quality standards, the head bails have triple protection and come with a five year warranty. The 200 Series head holders allow farmers to work safely and efficiently and tag or mouth cattle without incidence. Q-Catch head holders have a unique mechanism that holds under the jaw and both sides and the top of the head, restraining the animal limiting upper, lower and sideways movement. The 200 Series cattle crushes also feature a new hi-tech silent locking mechanism allowing an easy push-pull operation. For further information on the Q-Catch 200 Series cattle crushes or Commander’s efforts to increase OH&S compliance in the agriculture industry, please contact Commander Ag-Quip Innovative Farm Equipment.